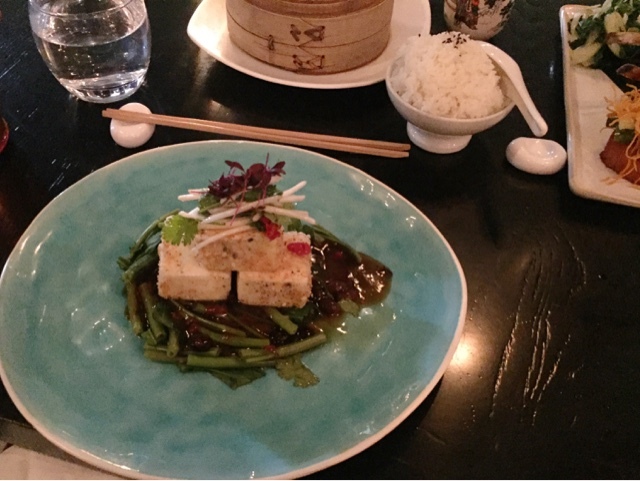 I decided to share with you the Vegan Food in London you can find at regular restaurants. I thought it might help others in a similar situation. I decided that eating a vegan/plant based diet is something I want to do for my health as I have had a ridiculous amount of digestive problems and allergies over the years as well as eczema and had heard and read many things about this diet being able to stop these problems. I decided to give it a try and I have been having great results health wise and found it much easier than expected. Please note, I am not saying you should do as I do, each to their own. Obviously you can google vegan restaurant and find a specific place that just sells vegan food. What I wanted to find was vegan food in my regular haunts. I just wanted to share some regular non-vegan/plant based places to eat or to pick up takeaway food that can be visited with non-vegans as well so everyone can exist in meaty or meat free harmony. ‘Ethical Vegans’ call people who just eat in a vegan way ‘plant based’ way rather than in every aspect of life that’s why I have included both terms. Homeslice – my favourite pre-and post vegan pizza place. The base and the sauce is vegan so just go for no cheese or meat and load up on veggies. You can either order slices of pre-made pizza or an entire pizza for £20. This was perfect, as my friend eats cheese, so we both had the mushroom, pumpkin seed and chilli, I had half with no ricotta, and she had half with some ricotta. The pizza is huge with a thin crust, delicious sauce and fragrant fresh mushrooms. Nom nom nom. The picture above is taken from my friend’s side of the table. The side furthest away from you in the picture is my non-cheese side. If you like wine they put a massive bottle on your table and only charge by the glass, which they measure at the end with a stick. Good for price, bad as you end up drinking quite a lot (but alright once in a while)! I absolutely love Homeslice and recommend everyone go there. Pizza Express pizzas are a similar price to Zizzi but taste much better in my experience and not only do they have a new specifically vegan pizza called the Pianta (spinach, chestnut mushrooms, pine kernels and artichokes on an arrabbiata base) you can also get any of their regular pizzas without cheese to make it vegan which tastes really good. If you wish to bring your own non-dairy cheese to be used if you are dining in their restaurant then bring along a brand new unopened package and they will put this on for you, how helpful is that? I recommend ringing to check the specific branch beforehand just to give them a heads up. Menu here. Carluccios – they do have a separate vegan menu, the only main is one pasta dish and there are a few starters and sides. You can check out the menu with the link here, not sure I would bother going there for one dish but hey, you might have to go there for a function and at least there is something! I wish they would make the gardiniera pasta vegan…come on carluccios! You can do it. Manca Menu you can see pictures of the pizza at fatgayvegan.com a great resource for London plant based eaters. Pizza Hut surprisingly have vegan bases in the UK. You can see here Vegan Pizza Hut Info The Pan and Gluten Free pizza bases are suitable for vegans at UK restaurants, so order a pizza with veggies, minus the cheese and ensure it’s either the tomato or BBQ sauce topping. You can also get the marinara pasta from the buffet if you are dining in the restaurant. Avoid all desserts as none are vegan. Good on you pizza hut. Papa Johns have confirmed to me via twitter if you hold the cheese and get the regular base and regular sauce then the ingredients are vegan. However their website nutritional info sheet is a bit confusing. 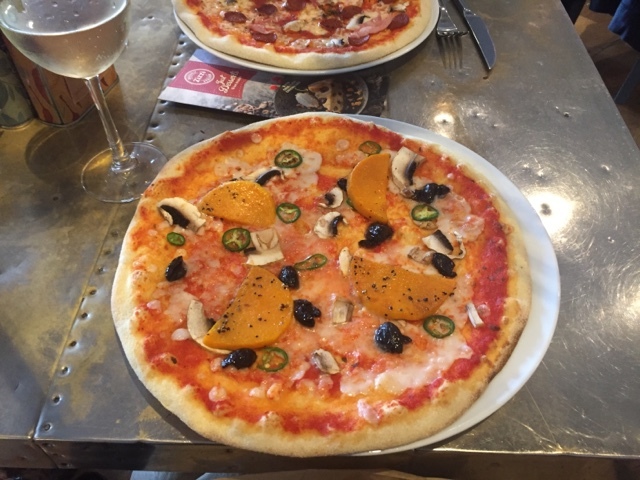 They say that there is a risk of cross contamination as their pizzas are prepared in the same place as other non-vegan pizzas but all of the actual ingredients of the pizza you order, as long as it is cheese free and with the regular base and regular sauce are absolutely vegan friendly. I had red and green peppers, chillis, onions, olives and mushrooms, and it was absolutely delicious. Big thumbs up to my local Papa Johns! amazing vegan ramen option which is the White Natural. 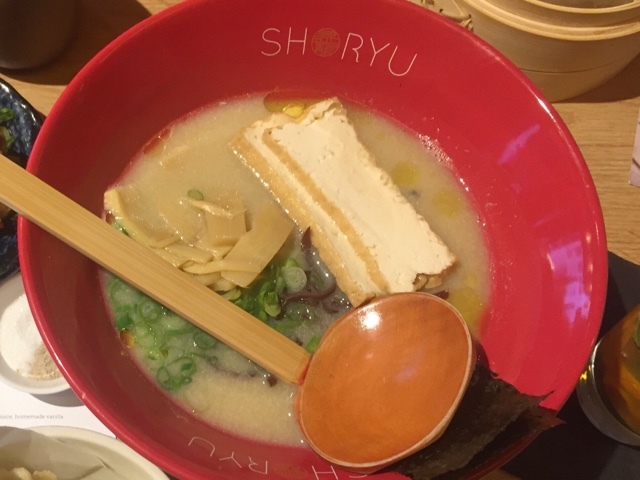 It’s a ramen dish with broth made from shitake mushrooms with noodles, tofu and veggies. This was absolutely delicious and one of the best vegan meals I have had. You can have the black bean tofu, edamame, vegetable side dishes and of course, plain rice. Wagamama – there are several vegan options on their menu, yasai gyoza which are steamed veggie dumplings, noodle dish yasai itame, edamame, steamed rice and a few side dishes such as the tofu, raw salad, green veggies etc. Look at the ingredient info here before going Wagamama Vegan Menu Info go to the bottom of the page and download the pdf which shows a simple yes/no if things are vegan or not (please take note other confusing restaurants). 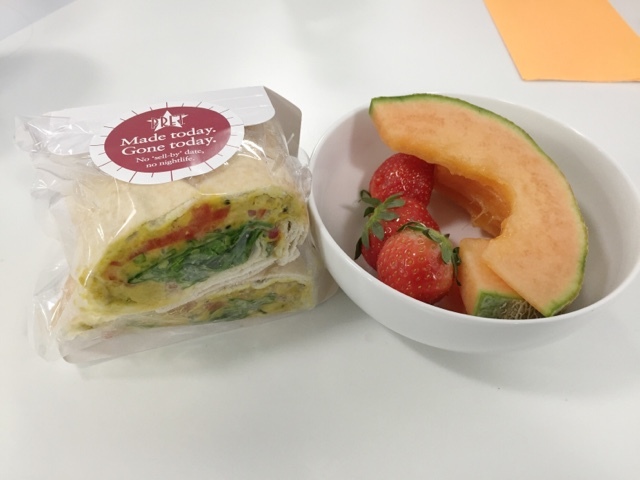 Pret a Manger – another lunchtime staple who have quite a few great vegan options. Skip to page 17 of the link here Pret Info Link to see what you can have that’s vegan. My favourite items are the sweet and salt popcorn, avocado and chipotle chickpea flatbread and the chana chaat flatbread. Delicious! Subway – you can get a tasty sandwich that can be toasted if you prefer and it’s quick and cheap. Go for the veggie delight with no cheese on one of the three vegan bread options. (9-Grain Wheat, Hearty Italian and Italian). Nando’s have vegetarian options that can be made vegan by removing the cheese and mayo. Try the soya burger or the Portobello mushroom wrap/pitta/burger. You can have the houmous with peri peri drizzle, red pepper dip, olives, nuts, garlic bread, chips, peri peri chips and chargrilled veg. For dessert you can have passion fruit gelato. Note that the sweet potato fries and mash are not vegan (I checked). The bean burger contains cheese so avoid. Nando Menu you can use the vegan filter on this menu but it then cuts out all of the burgers. I think it assumes you want the cheese/mayo. Gourmet Burger Kitchen (GBK) – Have a separate vegan menu. See it here http://www.gbk.co.uk/assets/img/pdfMenus/GBK-Summer-Allergen-2015.pdf but basically the Dippy Hippy burger is vegan. However, the fries and salad are not (they contain egg/dairy). There are obviously more places, these are the ones I have tried so far. I hope this is helpful. Please do let me know your recommendations below in the comments!